Just when you think you've read the best of the best from an author, they follow up with something to completely blow your mind. Bethany Chase stole my heart with her debut, The One That Got Away. Since then I have been eagerly anticipating anything else she'd write. There's a richness to her storytelling that has a way of grabbing me, but not in an instant choke hold -- more of a slow reach across the pages, wrapping tightly around my heart, then applying just the right amount pressure when you think you can't breathe another page. It's gorgeous, tangible, and unputdownable. This novel left me high and satisfied, the best of the best feeling when it comes to reading. Caroline has been married to her high school sweetheart for ten years now. They live the picture perfect lifestyle that their friends and family have always been envious of. Right away, Caroline's confidence was very apparent. Not only with herself, but also in her strong marriage to Adam. And I think that's why it became so unbelievably unbearable to understand when she discovers her husband has had an affair. And the blows don't stop there. It's a tumbling mess of revelations, one after the other. Caroline is lost, confused, and utterly crushed. She doesn't know who she is without Adam as her other half. It became difficult to witness these really lows moments, sunk beneath her deep sorrow. The ups and downs felt very realistic, and I appreciated how the author didn't expose the true conflict from the beginning. As the reader you find yourself living in these moments with Caroline as she is truly conflicted on where to go from here. How do you trust someone, even when they have shattered the very foundation of what that trust was built on, and yet still be so incredibly in love with them? It's definitely a journey not for the weak of heart. In the end, even after all the twists and turns that I had not been expecting and left me literally gasping out loud, I found peace right alongside Caroline. It was not an easy conclusion to come to, nor was it finalized in those last few chapters. But there's a sense of finality that leaves the reader satisfied, uplifted, and even full in the outcome of it all. 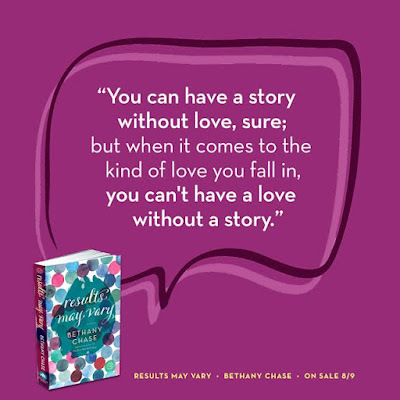 Bethany Chase's storytelling shines bright with this one. I could not put it down, and ended up reading it in just under 24 hours. Her brilliance at weaving solid, emotional, yet so identifiable characters continues. I cannot wait to see where she takes us next. 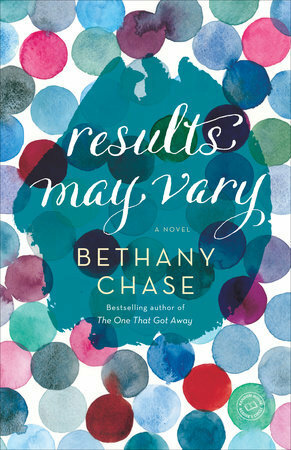 As a fan of both books + music, I am very pleased to have author Bethany Chase sharing her writing playlist for Results May Vary as part of the blog tour. See which songs she chose, then have a listen at the bottom. Enjoy! This is an interesting thing to write about, because this book has such a different musical personality from my first book, The One That Got Away. When I was writing that, I was listening to a lot of classic soul and 70’s rock (think Guardians of the Galaxy soundtrack), and that made its way into the book in many places. Results May Vary’s playlist is a lot more eclectic, both on purpose and by accident. 1- Sugar & the Hi Lows, “Right Time to Tell You”: This song is gorgeous. The melody and harmonies are about as pretty as it gets, and the lyrics are incredibly apropos to Adam’s situation—the narrator has something to confess, has been waiting for the right time to do it, but no time is ever the right time. 3- Band of Horses, “No One’s Gonna Love You”: Really sums up Caroline’s feelings toward Adam in the early part of the book. 4- Amos Lee, “Chill in the Air”: Another beautiful breakup song (in this one, it’s the steel guitar that cinches it), and a nod to Caroline’s predilection for mopey singer-songwriters. I think Amos is fantastic, but the man sure can write a good mopey song. 5- The Grateful Dead, “Fire on the Mountain”: This is one of my personal favorite songs that I was delighted to give to a character. I am only an entry-level Deadhead, but the guitar riff on this song is just so mellow and pretty that I could listen to it for hours. Or, you know, 13 minutes, which is the length of the longest live version of it that I own. 6- The Apache Relay, “Katie Queen of Tennessee”: Very pretty little love song from one of Jonathan’s favorite bands. 9- Rogers & Hart, “Bewitched, Bothered and Bewildered”: I have an Ella Fitzgerald recording of this song that is one of my favorite all-time pieces of music. Ella’s voice is so beautiful, and the song’s lyrics have this sly, witty charm that—yes, I sound like an old person—you so rarely find anymore. “I’m wild again, beguiled again, a simpering, whimpering child again…” It’s such a great description of being infatuated. I'm currently in the middle of reading Results May Vary, and I'm so drawn into Caroline's story already! I'm very curious to see how it all concludes. Love that you shared this playlist today, G! Beautiful review! I've been seeing a lot of good things about this book so I really need to get it.